BLUSHIN’ BABE – Yeah.. like the mermaid. I’ll admit that up until a few months ago, one of the items you’d never find in my makeup arsenal was blush. I was actually afraid of it — I thought I’d look like a clown because I’m so pale, I didn’t know how to apply it, I didn’t know what color to choose or what kind was best (cream? powder? so many choices!) so I just avoided it altogether. I also felt like because my skin has naturally pink undertones (and I tend to blush on my own A LOT thanks to never-ending shyness and social anxiety) so I figured, why make my cheeks even redder than they are already?! But I can admit when I’m wrong and in this case, I was so wrong. A makeup artist convinced me that blush is a crucial part of the makeup process and now I see how right she was. First things first, there are so many shades of blush and many of them look great on all skin tones (really, I swear!) and the great thing about blush is, you can control how much color you get. If all you want is a little swath of color, a light brushstroke is all you need. For a more dramatic look, you can build up the color quite easily. 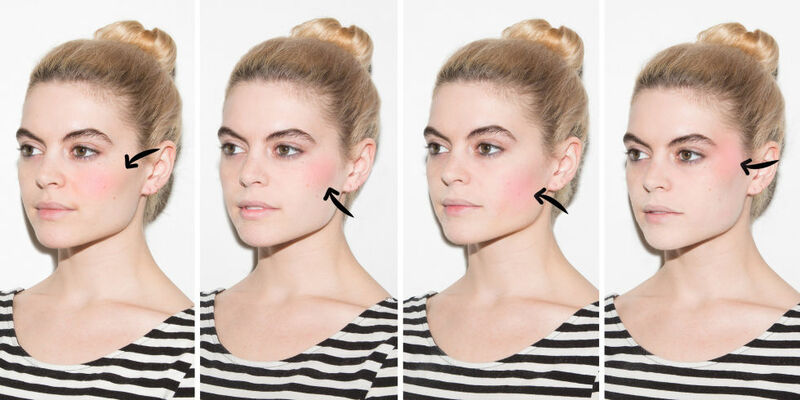 This Marie Claire tutorial shows the best placement for blush in an easy-to-follow image, seen here. The two blushes I use most often are Milani Cosmetics‘ Baked Blush in Luminoso (a luminous peachy pink) and Sisley‘s Phyto-Blush Eclat in Peach. The Milani offers a brighter pop of color for days when I want (or need) a brighter look, and Sisley is great for a light, healthy flush of color. Milani is inexpensive at $8.95 and can be found at major drugstores. Sisley’s is much more expensive, clocking in at $88. Now that I’ve jumped on the blush bandwagon, I cannot believe I ever went a day without it. I seriously won’t leave the house without blush on and am embarrassed I was so afraid of it for so long. I look like a zombie without some blush! It’s the perfect topper to give skin a warm, beautiful glow, no matter the season or reason. It’s such a great way to give a little pop of color to your face, esp. for special occasions! I’m so terrified of blush for the same reason! I wear a little but I don’t know if I see a difference with how lightly I apply it. A makeup artist suggested the Milani Baked Blush in Luminoso because she said it’s flattering to all skin tones, but I agree, since I am extremely pale, it’s so easy to veer into clown territory with makeup! I was same till few months ago! Now I cant not wear it.